Precast hollow-core concrete slabs are not just ideal as a reliable and time-saving solution for building floor slabs, as a recent project shows. 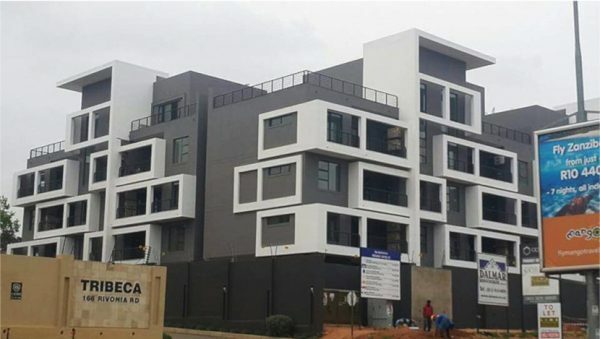 Slabs manufactured by Elematic South Africa (ESA) have been used in an innovative fashion to create a striking façade on The Odyssey, an upmarket apartment building in Morningside, Sandton. Although the slabs supplied by ESA have also been used for all the suspended floor slabs on the approximately 3,000-m2 project, they have also been applied on the balcony cantilevers. In creating a visually interesting three-dimensional form, the slabs were used in a rather unconventional but very effective way. The result is a play of rectilinear elements in different planes. Creating this same effect with the alternative method – cast-in-situ concrete – would have been considerably more complicated and time consuming. Carl Eckert, a partner at Messaris Wapenaar Cole Architects (the firm responsible for the design) explains that even though there were some challenges associated with ensuring that every element worked together structurally as well as visually, ESA’s in-house engineer and design team worked tirelessly with them to develop the most appropriate solution. ESA’s director, Craig Webber, was also regularly on hand to address any queries. The project is being developed by Limestone Prop – a well-known residential property developer, and built by Dalmar Construction. Conrad Swart from Dalmar Construction comments that the company has worked with ESA since 2006, and has experienced consistently good service, delivery and product quality from the hollow-core slab manufacturer – so much so that it now works almost exclusively with ESA. The Odyssey is yet another in the long list of projects completed together. The smooth collaboration between the various members of the professional and contracting teams has proven that unexpected and innovative solutions can be achieved when all parties commit to working collaboratively. The resulting building is a striking, modern, luxury apartment complex which will be an asset to its neighbourhood. Located almost opposite Morningside Shopping Centre on Rivonia Road, it has a prime address, its first phase is now complete and the second phase is due to commence shortly. Phase One consists of 29 units, which range from approximately 100 m2 for a standard unit to over 300 m2 for a luxury penthouse unit. Phase Two will see the construction of a further 32 units. Elematic South Africa (Pty) Ltd manufactures precast hollow-core concrete slabs for the South African market. Elematic is a well established international brand. The company was established in Finland in 1959 and has since set up precast production plants in more than 70 countries worldwide. As part of the Consolis Group, which focuses on research and development in cement and precast concrete products, Elematic is backed by extensive knowledge and experience. Elematic South Africa supplies the latest available technology in precast concrete products. Its state-of-the-art production facility on Gauteng’s East Rand is ISO 9001 certified and all its products carry the SABS mark of quality.